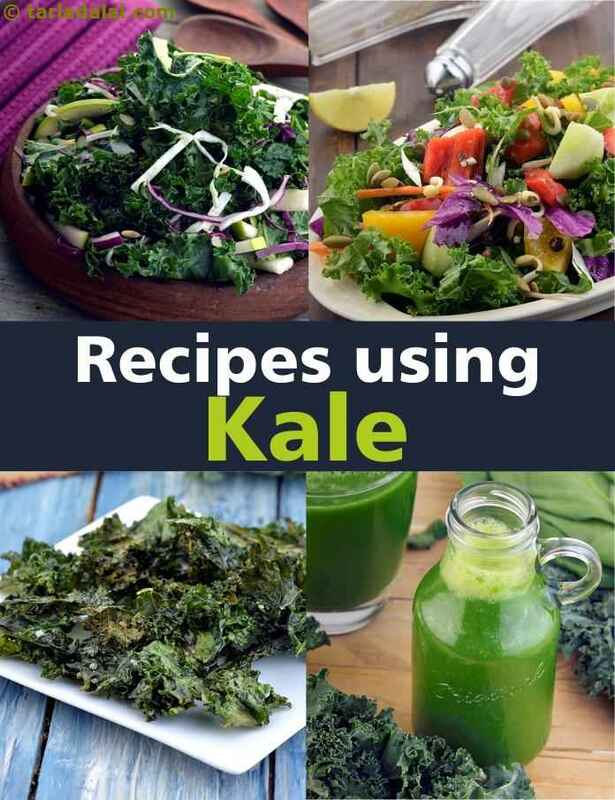 kale recipes, Indian Kale recipes. India's use kale in juices, salads and snacks. We all know that kale is now one of the deemed super foods. So what does Kale have to offer? Like most greens, it certainly has been deemed as a low calorie vegetable. But that’s not all. It’s also filled with fiber, is packed with antioxidants and of course low on carb count too. All this together reaps long term health benefits. Kale goes well with Indian snacks. Kale and Quinoa combine well to make Quinoa Kale Khakhra recipe which is one of our collection of nutritious khakhra recipes. These khakhra are bound of all nutrients and an amazing alternative to kill your hunger pangs especially during office hours. Make these khakhras in batches and store them in an air-tight container. Baked kale chips are actually quite easy to make at home and healthy. There is nothing but kale, healthy olive oil and sea salt in the recipe. This is a far healthier snack for and your kids to have as processed chips at times contain 30% oil plus unhealthy potatoes. Kale is very easy to mix and match with Indian salads. The jowar kale palak salad is an exciting medley of jowar, kale leaves, broccoli, mushroom and other veggies and greens, laced with a lemony and spicy dressing, this salad reboots your day with its awesome blend of textures and flavours. This Kale, Masoor Veg Antioxidant Healthy Office Salad recipe is one such scrumptious treat that combines a selection of fabulous ingredients ranging from masoor and kale to cabbage, mushroom, sprouts and cheese. When making a lunch salad, always pack the dressing separately and toss the two together just before eating. This delicious Kale and Apple Salad recipe combines the unique flavour and texture of kale leaves with crunchy strips of apple, shredded cabbage and melon seeds. A tangy dressing of honey and lemon adds to the spectrum of flavours that this salad offers your taste buds! Serve it immediately upon tossing to enjoy the bubbly, fresh flavours. Kale is considered by experts to be one of the most nutrient-dense ingredients in the world, and fortunately for us, it is tasty too, especially when you choose the mildly-flavoured, small-leaved variety. Here, we have made a mouth-watering Palak, Kale and Apple Juice, which has a very balanced flavour and nice texture. The ingredients are rich in iron, vitamin C and fibre, which makes it a nutritious snack for weight-watchers. Kale : Of all the superfoods you can think of, kale is one of the most healthiest you can rely on. Along with vitamins like vitamin A and vitamin C which act as antioxidants, flavonoids like lutein, kaempferol and quercetin are also found in relatively large amounts in Kale. Kale has a perfect omega-3 to omega-6 fatty acid ratio, thus making it a super anti-inflammatory food. Kale helps increase our white blood cell (WBC) count to fight all types of infections. Kale beneficial to diabetics and heart. See detailed benefits of kale. Enjoy our kale recipes, Indian Kale recipes below. A wholewheat flat-bread with added nutritional value of kale and tomatoes. Flat-bread cooked in Indian way with added kale and tomatoes.